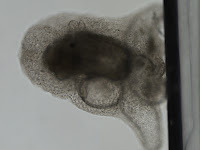 Ascidians (class Ascidiacea), commonly known as sea-squirts, are a class of sessile, filter-feeding chordates who live solitarily or colonially inside an extracellular “tunic.” Although the adults have no overt chordate features, their free-swimming tadpole-like larvae have a tail supported by a notochord, homologous to the spinal cord in vertebrates, and a hollow nerve cord like that of other chordates (Sasakura et al. 2012). The following pictures detail the process of larval settlement and metamorphosis in a colonial ascidian Distaplia occidentalis, a fouling organism on floating docks in NE Pacific marinas. 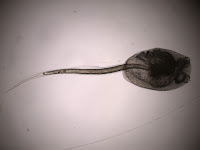 This is a lateral view of a recently released tadpole larva. Almost all colonial ascidians brood their larvae, and release them for a brief planktonic period (minutes to hours). The dark spot near the base of the notochord is the sensory vesicle, which contains both a light-sensing ocellus, and gravity-sensing organ called a statocyst (both pigmented). At the anterior end of the tadpole’s trunk (to the right) one can see two bulbous structures just under the tadpole’s epidermis. They are called adhesive papillae. They are everted at settlement to initially adhere the tadpole to the substratum. Upon contact with whatever substratum the larva deems suitable for settlement, the tadpole rapidly (< 1 min) everts its papillae, the tips of which secrete an adhesive substance. This picture shows eversion of the adhesive papillae. 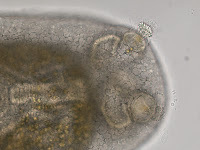 A Distaplia tadpole has three adhesive papillae, and two are in focus here. The adhesive filamentous material seen radiating from the base of the papillae is secreted by the epidermal cells of the everted papillae (Cloney 1978, and previous studies by the same author cited therein). A study by Flores and Faulkes (2008) suggests that ascidian tadpoles may be able to differentiate between different types of surfaces on which to settle (e.g. smooth vs. sandblasted), possibly due to the presence of mechanoreceptors in those epidermal cells. After eversion of the papillae, the ampullae, large adhesive lobes which create a more permanent hold to the substratum, are everted. The ascidian begins to reabsorb its axial complex (the notochord, nerve cord, and associated musculature of the tail) and develops the respiratory and feeding structures that characterize the adult. This picture shows a recently metamorphosed juvenile, its ampullae (short root-like structures) attached to the substratum (the side of glass slide). The tail is reabsorbed within a few hours after settlement. The large dark shape inside is the remnant of the larval axial complex plus the developing branchial basket of the juvenile. The little dark spot at upper right of the dark shape is the degenerating sensory vesicle. Immediately above the sensory vesicle one can see one of the two developing siphons, through which the adult ascidian pumps water to breathe and feed. Cloney, R. A. (1978). Ascidian metamorphosis: review and analysis. In: Settlement and metamorphosis of marine invertebrate larvae. Chia, F.-S. and Rice, M.E. (eds). Elsevier. New York. pp. 255-282. Flores, A. R. and Faulkes, Z. (2008). Texture preferences of ascidian tadpole larvae during settlement. Marine and Freshwater Behaviour and Physiology. 41(3): 155-159. Sasakura, Y., Mita, K., Ogura, Y., and Horie, T. (2012). Ascidians as excellent chordate models for studying the development of the nervous system during embryogenesis and metamorphosis. Development, Growth, and Differentiation. 54(3): 420-437. This blog is meant as a collection of short illustrated articles on reproductive biology, embryonic and larval development of marine invertebrates. These articles are composed by the students of Comparative Embryology and Larval Biology course taught by Dr. Svetlana Maslakova at the Oregon Institute of Marine Biology in Charleston, Oregon (USA). We try to edit content for scientific accuracy. If you notice a mistake, please, let us know. The images displayed here are for educational purposes only. You are welcome to borrow these to use in lectures or student presentations, with appropriate credit to the source. Please, note, that we do not have an easy way to track down students from past courses who took the pictures posted here to request permission to publish and obtain full resolution images.